This weekend, Chickpea and I headed to downtown Daegu for some live music and drinks to help out the folks in Japan. 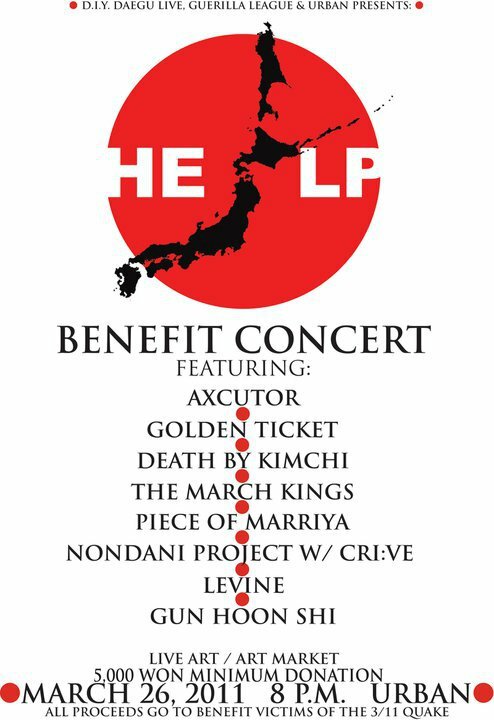 DIY Daegu Live, Guerilla League, and URBAN organized eight bands, a DJ and some craft vendors for an awesome benefit show. Here’s some video of the bands from that night, including the first Korean death metal band I have ever seen (check it out, it’s at the 4 minute mark). I apologize in advance for the bad sound quality of the louder acts. 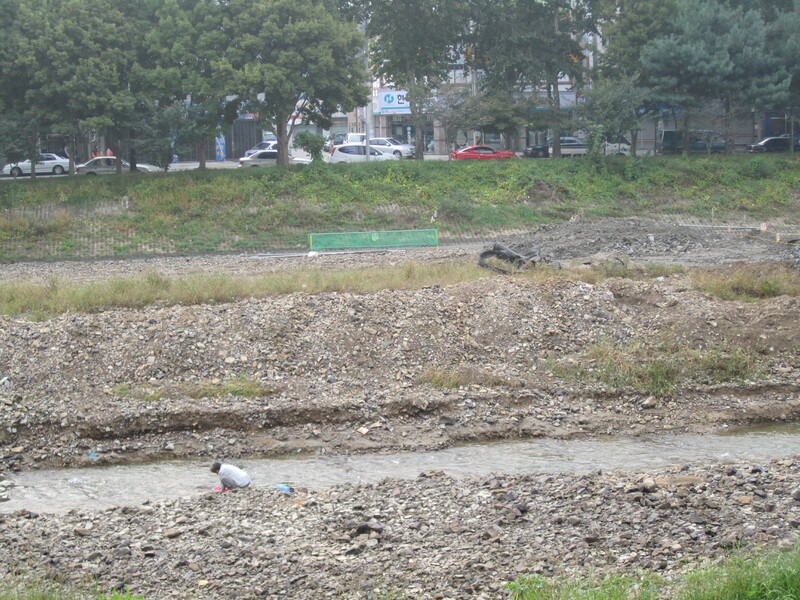 Dalseong Park is the oldest park in Daegu. Located in the central part of the city, this park has some nice hiking trails overlooking downtown and surrounding neighborhoods, some gardens and historical statues. But the main attraction has been the zoo. Now, I’ve been to zoos across the U.S. and seen some sad sights, but nothing really compares to this zoo. Watch the video, but WARNING: animal lovers will not enjoy it. If you live around Daegu and are looking for something indoors to do in the next couple of weeks (this Floridian is ready for spring), Alex and I are giving our official stamp of approval to Trick Art, the traveling exhibit that’s landed at EXCO until Jan. 22. You might learn a little about classic art, but mostly you’ll just make rude poses that make other spectators uncomfortable. Many buses go right to EXCO, but if you are cabbing it, any taxi driver should know where to take you. Admission is 10,000 won and worth every bit. We spent about three hours making fools of ourselves, but depending on how creative your poses are, you could really make an afternoon of it. Now go forth and get tricky! New airport train opens, Daegu to Incheon Airport in just under 3 hours! Life just got easier for far flung expats and Koreans who need to fly out of the country via Incheon Airport. On Tuesday, the second phase of the AREX commuter train opened, allowing passengers to move from Seoul Station to Incheon Airport in 43 minutes. It’s truly a belated Christmas present from Korea’s transit authorities! As Chickpea and I were preparing for our upcoming winter vacation in Southeast Asia, we ran into an unexpected obstacle: getting to the airport. We assumed that all major cities in Korea (Daegu, Busan, etc.) were linked to South Korea’s main airport, Incheon Airport (ICN), and moving ourselves and a few pieces of luggage would just be a matter of taking the bullet train (KTX) to Seoul and then hopping on a subway or some other easy form of transport. 1. Take the Daegu to Incheon Airport Bus. Pros: Takes you right to the airport; no transfers; about 30,000 won makes it the cheapest option. Cons: Nearly 5 hour journey; can’t buy tickets online; only a few buses run each day (a problem since we want to leave right after we get out of school); possible traffic delays. 2. Take the KTX train to Seoul Station and hop on an airport limousine bus. Pros: Perhaps faster; not a bus; order train and bus tickets at the station for a discount. Cons: While the KTX may be fast (2 hours from Daegu) the times for the bus vary between 1 hour 15 minutes and 2 hours and that’s not figuring in any traffic delays. 3. Take the KTX train to Seoul Station, hop a subway to Gimpo Airport and then an express train to Incheon Airport. Pros: According to blogs and forums this is the best value; takes a little over 3 hours. Cons: 3 transfers (you have to transfer on the subway twice to reach Gimpo; big possibility of getting lost and confused and taking a few extra hours. 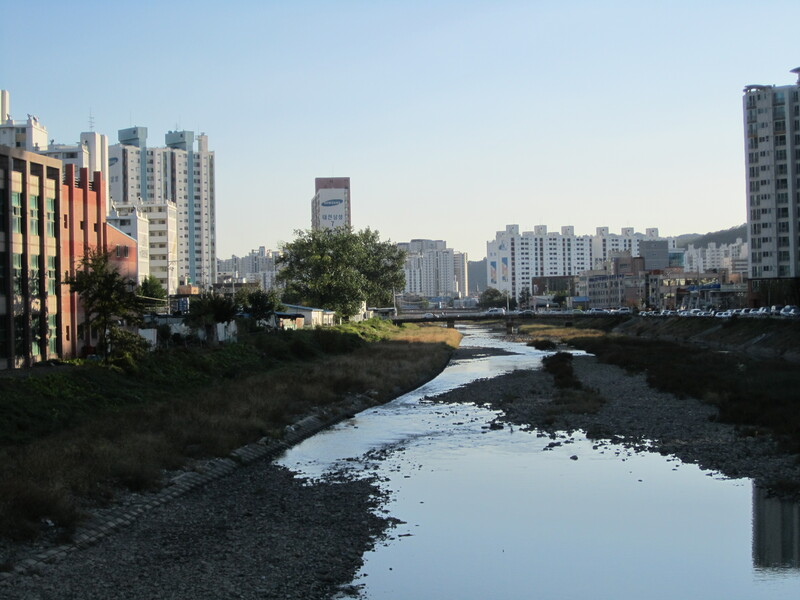 Of course, you still have these options, but now travelers in Daegu can board a comfortable KTX train to Seoul Station (just under 2 hours) and then hop on this express train straight to the airport (45 minutes). The cost? Roughly 39,000 won for the KTX ticket and 13,000 won for the express train ticket ($45US total). The price is even less if you take the slower commuter train to the airport (3,700 won) that will make 10 stops and delay you about 10 minutes. What’s more, you can even check in with your airline — luggage and all — at Seoul Station. In a few more years, the trip will get even easier. 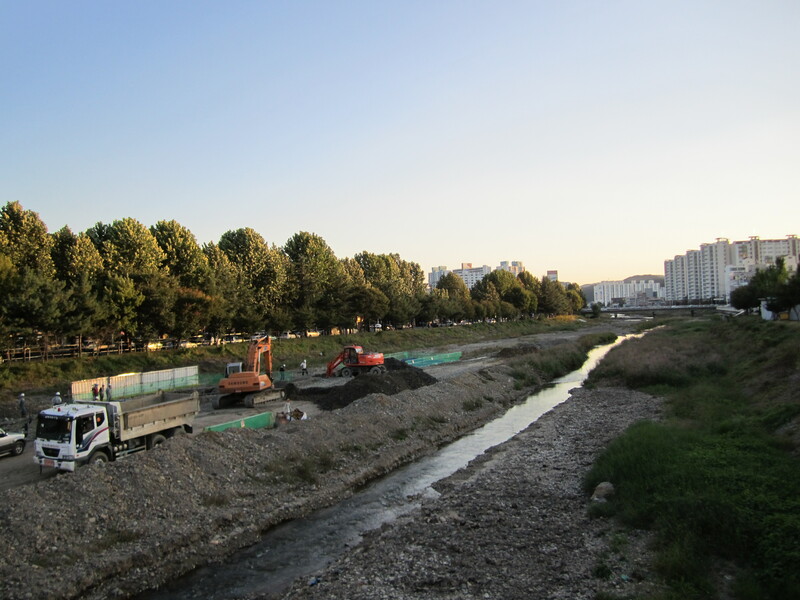 Korea has already started work that will allow the KTX trains bound for Seoul to go to straight to Incheon Airport . For those in Busan, this would cut a trip that takes roughly 6 hours now to only 2 hours 40 minutes. Wow. The only downside is I cannot find where you can buy tickets for this train on an English website. If anyone finds out, please leave a comment with the info. I plan on just getting my ticket at Seoul Station. Here’s a guide to getting those AREX tickets at Seoul Station. See you on the train! UPDATE: A fellow English teacher reminded me there is another way to get from Daegu to Incheon Airport: by air. There is one flight each day from Daegu Airport to Incheon. I’ve read prices are 50,000-70,000 won. Still a bit expensive and not very useful, but could work in a jam. 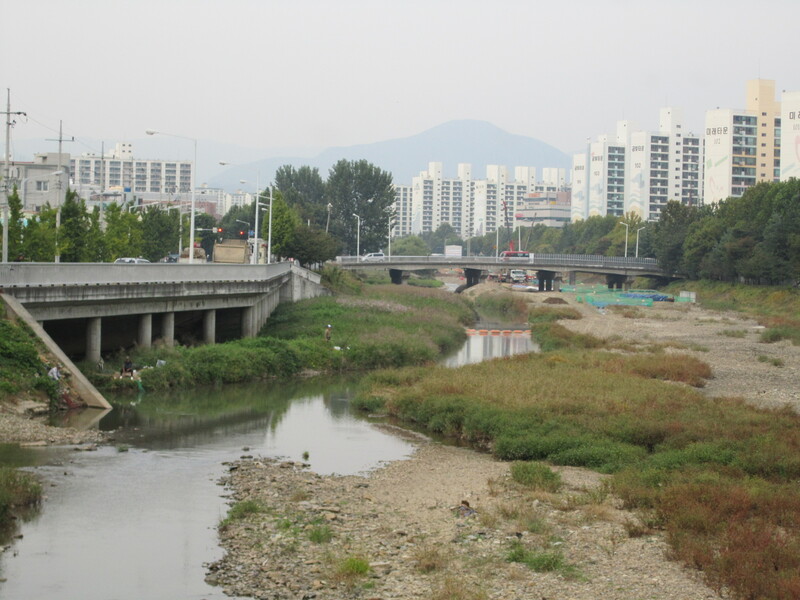 Here’s another site detailing all the ways to get to/from Incheon. In our ongoing effort to embrace Korean music, Chickpea and I hit up Club G2 in downtown Daegu last night to see Supreme Team, who you might remember from my video of the 2010 Daegu International Bodypainting Festival. We spent nearly six hours in a packed, smoky club to catch of a glimpse of our favorite Korean hip-hop duo, which is also the only Korean hip-hop duo we know of. 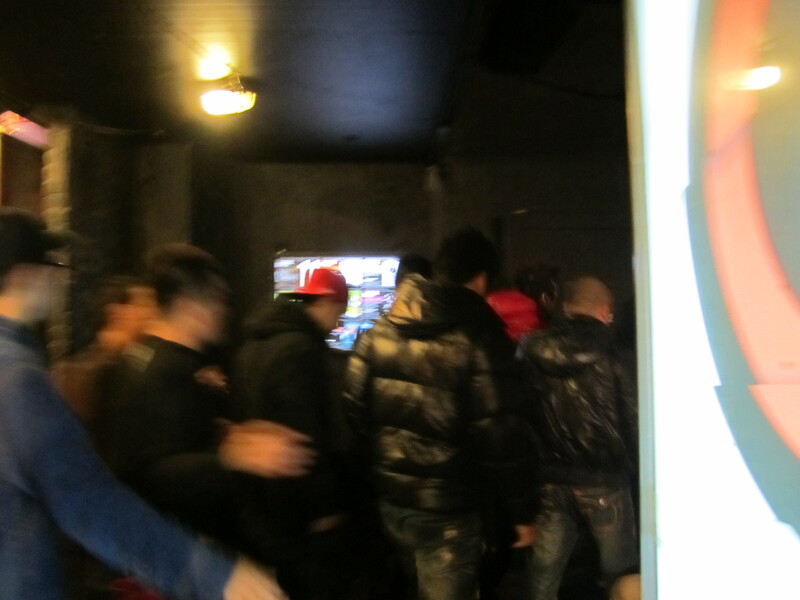 Highlights: The graffiti art inside the club, Korean guys comfortable enough to dance with each other and my blurry photo of Supreme Team entering the venue. Lowlights: The $6 beers, the $7-8 drinks, the late arrival of Supreme Team (2 a.m.? Really?) and their short five song set. 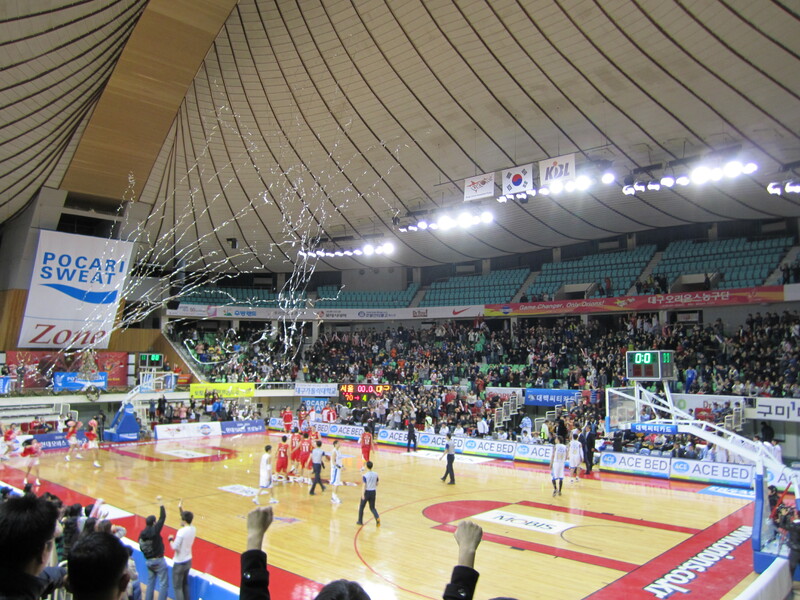 It was just another Saturday night in Daegu. Chickpea and I met some of our expat friends at Viniroo, a walk-up liquor-in-a-bag drinking establishment, and we made the rounds of our usual haunts downtown. But we were restless. Our main bar– JEEEP (actual spelling) — was empty and our group of five wanted to dance somewhere new. We were searching for a suitable club when I looked down an alley and spotted a place with a large (fake) fire engine jutting from the building. This was Club Siren. “Let’s go here,” Chickpea said and our group headed toward the door. At that point, the bouncer reached behind his podium and produced a Tazer. Then, he demonstrated its power. Zap! We walked away at that point — flabbergasted, disturbed and a little sad. To be sure, this is not common. 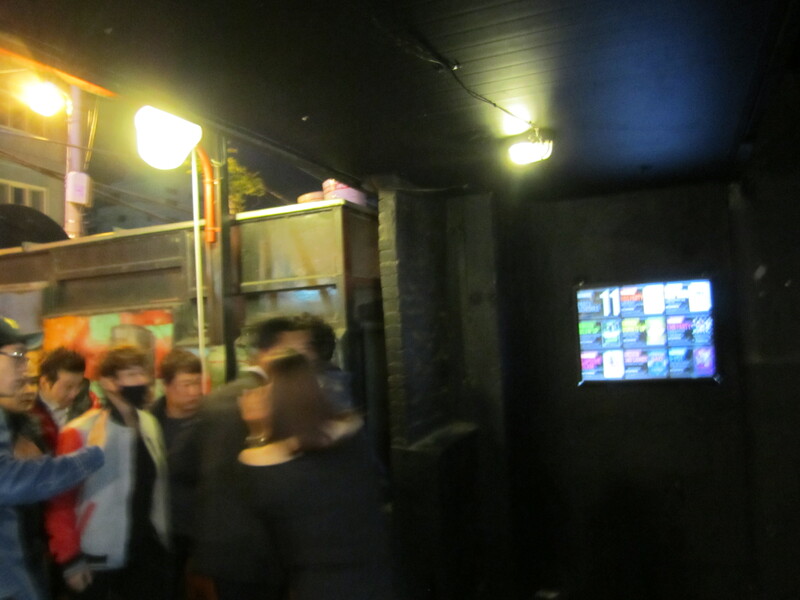 Chickpea and I have entered several Korean clubs in which we were the only foreigners. We have many friends who have done the same. I find Korean bouncers, bartenders and patrons to be very professional, even overly nice. But this kind of discrimination does exist. Dave’s ESL has a year-old message board thread listing the bars that have denied entry to foreigners. I’ve heard there are foreigner-only bars in Korea near military bases and these are run by other Koreans. Also, while I don’t think this makes it OK, I know some bars have had some real problems with Westerners, especially American military. That might account for why this guy had a Taser. It doesn’t make it right, but bad behavior is the same reason why many U.S. clubs have a dress code. And, obviously, U.S. clubs discriminate, too. Just not so flagrantly. Plus, as some people have noted on other sites, some clubs have complicated rules on drink limits, ordering food, table prices, etc. and some club owners simply bar foreigners because they don’t want to/ can’t explain this in English. 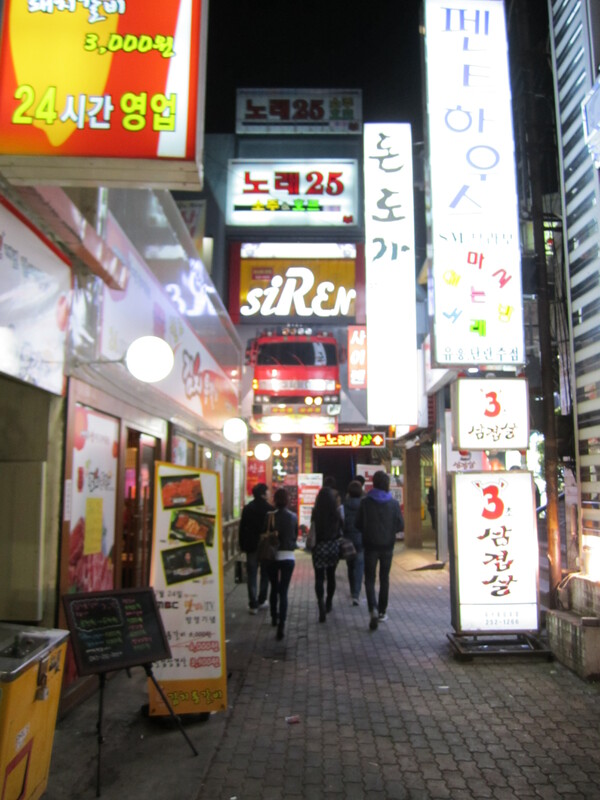 I don’t think anyone should let this play into any decisions about coming to Korea or enjoying the nightlife — it is rare — but words of wisdom: If a club bouncer says “No foreigners allowed,” it’s best to not argue the matter. They might have a Taser. Yes, that’s right. We’ve really been enjoying the bounty of seafood that Korea has to offer, from live octopus to giant clams, fish and squid in various states of dessication and more. 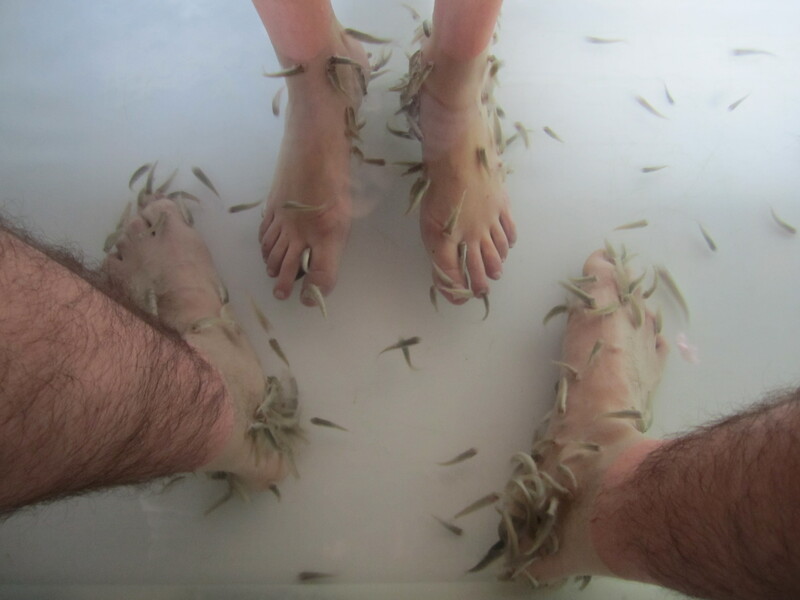 So, Alex and I decided to give a little back: We went to Doctor Fish. These are tiny fish — a little bigger than a minnow, maybe? — that eat the dead skin off your feet. It was originally used to treat eczema and other skin problems, but now it’s mostly used as a spa treatment. I’ve been wanting to try this this I came to Korea (If I’m being honest, since I saw it on the Tyra Show a couple years ago. Full disclosure). On Sunday, I found Namu Story, (for Korea peeps: it’s across from the UniQlo in downtown Daegu) and convinced Alex to go with me. Just as interesting as the experience itself is where the Doctor Fish are: in a a big cafe. Yes, a tank of fish sunk into a raised platform at one end of a large, posh, second-story cafe. So while people are drinking their coffee and eating their pastries, Alex and I (okay, mostly me) were giggling in a corner while tickly little fish ate dead skin off our feet. I thought it would take a while to get used to, but in a matter of minutes I was able to stop laughing and enjoy. It’s like a little massage! The best part is this: there’s a $3 entrance fee to get into the cafe, but it’s all-you-can-eat croissants and coffee, and the Doctor Fish treatment is less than $2. It was a great way to spend a relaxing Sunday afternoon. UPDATE (3/8/11): Namu Story, the coffeeshop where we first experienced Dr. Fish, is no longer offering the service. Check back here for updates on other nearby Dr. Fish proprietors.